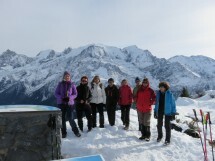 I organize a winter hike to the Mont Lachat from Saint-Gervais (65 km from Geneva) on Sunday February 26th. Departure from Bionnassay (the Crozat), alt 1400m. Climb to the north at Voza Pass, then on a gently sloping ridge along the Mont Blanc tramway. At the Mont Lachat pass, climb the summit. You can descend by the north road which dominates the Houches, returning by the Chalette, following the path of Rognes (path created during the purge works of the glacier of Tête-Rousse).A circular route. A superb very progressive snowshoeing. A gradient of 750 m and a distance of 12 km. Walking time: about 5 hours.